From group fitness classes and free-standing machines, to friendly staff, beautiful facilities, and multi-club memberships, Seacoast Sports Clubs offers many amenities to its members. Below are 10 ways Seacoast Sports Clubs (SSC) stands out as a one-of-a-kind, one-stop fitness destination! Seacoast Sports Clubs offers childcare at all four locations! The Great Bay gym maintains FOUR indoor tennis courts—take a private or group lesson, or rent a court for a friendly doubles match! Members receive all-inclusive access to all four gyms in Newmarket, Seabrook, and Portsmouth (x2). Steam rooms and saunas!!! Need we say more?? The Greenleaf club has a saltwater swimming pool! In addition, you can enjoy a relaxing hot tub sesh at the Greenleaf and Great Bay locations. For active kiddos, SSC hosts swimming lessons, tennis lessons, and Youth Fitness Training. Racquetball courts are located at the Greenleaf and Great Bay locations. Added bonus: all equipment is provided! 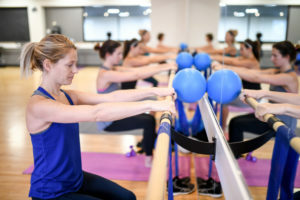 All locations offer group exercise classes that range from TRX and indoor cycling, to yoga and barre. We do love variety!! A track and juice bar are highlights at the Seabrook location! A little post-workout fuel anyone?? “Women’s-Only” workout areas are also available at select locations! If you’re interested in giving Seacoast Sports Clubs a whirl, call the club location of your choice to receive a complimentary 7-Day Membership Trial! !